This ornate initial ‘P’ contains an illustration of Queen Mary I and her husband, Philip II of Spain. It begins a document confirming the rights of the College of St George, called an inspeximus [SGC X.3.7]. Mary I was the eldest surviving daughter of Henry VIII and his first wife, Catherine of Aragon. She was a devout Catholic and during her reign violent methods were used to reverse the reforms of her Protestant predecessor and half-brother, Edward VI. She reigned for a little over five years between 1553 and 1558, but her accomplishments and triumphs, both in England and in the College of St George, are overshadowed by her bloody reputation. The Latin word inspeximus, meaning ‘we inspect, or examine’, indicates a document which confirms a previous charter or letters patent. Mary I issued this three page inspeximus on 28 February 1556. By it she confirmed the conditions of the Great Charter of Liberties initially accorded to the College of St George by Edward III in 1353, in addition to other royal grants to the Dean and Canons of Windsor. The Great Charter of Liberties included the rights to be independent from the Archbishopric of Canterbury and from Royal taxation, as well as the right to collect the revenues of lands owned or granted to the Dean and Canons. During her reign Mary not only ensured the College of St George would retain its liberties, but also reversed some of the reforms made by Edward VI and his council. She built new lodgings for the Poor Knights (today called Military Knights) and ensured that they received the grants her father had bestowed upon them, settling years of dispute. She also ensured that music was an integral part of Chapel services once again. Edward VI had restricted its presence, banned the organ and determined that virtuous men should be employed in the choir, regardless of their musical talent. 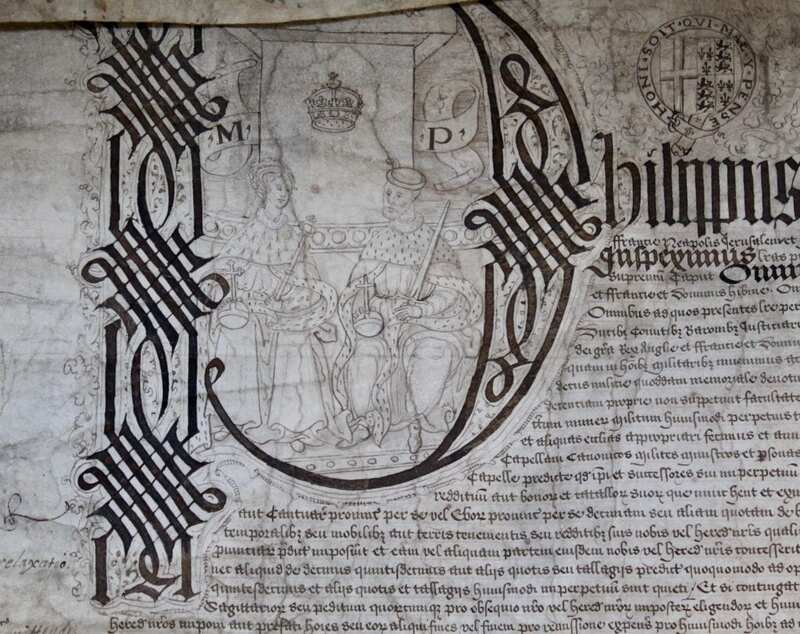 Mary and Philip are depicted as joint rulers in the decorated initial which begins this document – the P of Philip’s Latinised name, ‘Philippus’. They were married in 1554, despite popular opposition to the match. At the time, the legal doctrine of jure uxoris, whereby a man inherited all his wife’s lands upon their marriage, endangered her position as the sovereign. There was a fear throughout England that the country would become another vassal of the Habsburg family through Philip’s control of Mary, especially as he could maintain power after her death. Parliament therefore issued Queen Mary’s Marriage Act. They determined that only during her lifetime would they both hold equal and joint authority. Consequently, they appeared on all official documents together, as is shown here. 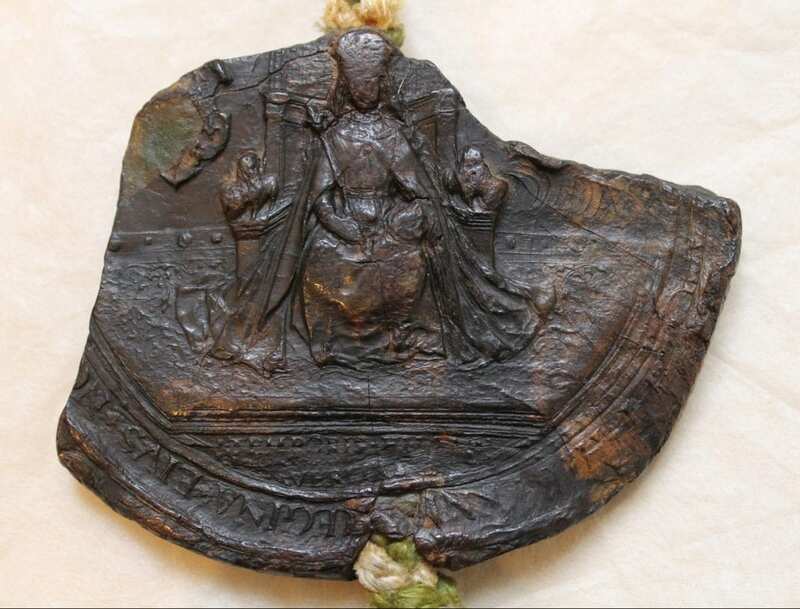 The Great Seal attached to this document features only Mary. 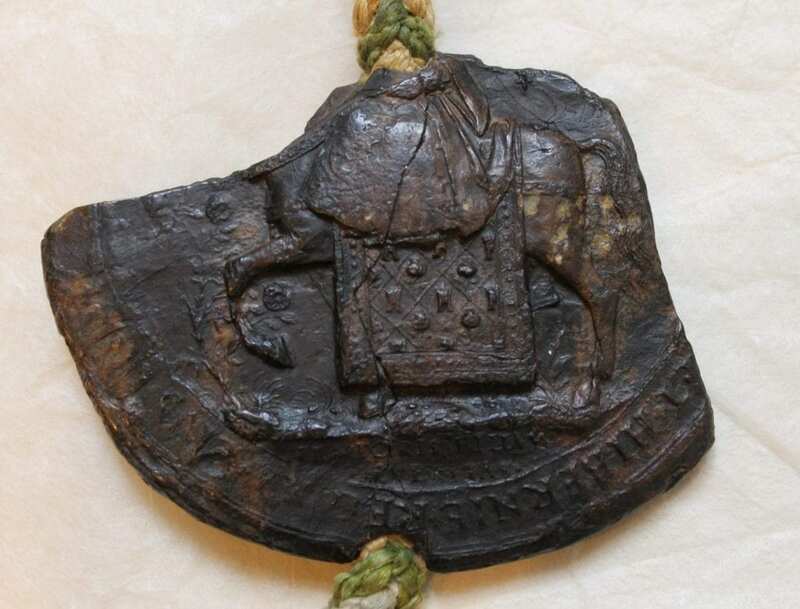 On one side of the seal the Queen is seated upon her throne and on the reverse she is on horseback. The seal is affixed to a parchment document by surviving green and gold silk; it authenticates the content of the Inspeximus. Mary died in November of 1558, the throne passing next to her half-sister Elizabeth I. Elizabeth never had such an ornate Inspeximus produced for the Dean and Canons. Rather, she ratified Mary’s proclamation with an affixed note on parchment [SGC X.3.7*].